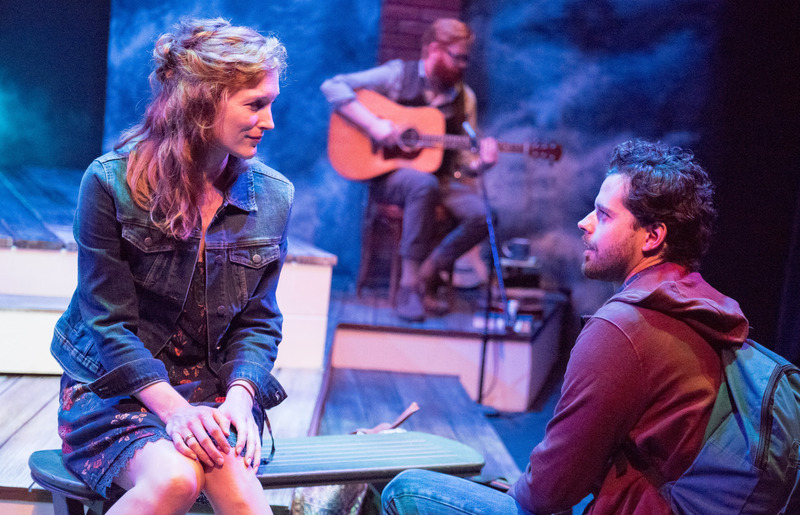 Jessica Lind Peterson and Jason Peterson in Yellow Tree Theatre’s String. Photo by Justin Cox. Yellow Tree Theatre is a professional theatre that is in my backyard. Well, not quite my backyard, but it is relatively so, being the only theatre that I can drive to without taking the freeway. It is hard to believe that this “new” theatre is starting its tenth season and that I have managed to see at least one production there every season. To celebrate its Tenth Season, Yellow Tree is reprising a play from its first season titled String. The theatre was founded by Jessica Lind Peterson and her husband Jason Peterson. Jessica Lind is also the playwright for String, in which she and her husband Jason also star. Yellow Tree has performed some very impressive shows over the years, but I was struck by how much I really enjoyed this reprisal of String. Sean Byrd’s direction brings out an earnest charm in what could have easily been of rehash of the theme that a “diamond in the rough” may be better for you than the person who appears to be perfect. The show concerns Riana (Jessica Peterson), a recent graduate student in English and an aspiring poet. Riana longs for a romance similar to the romance between the famed poets Robert Browning and Elizabeth Barrett Browning. While she is waiting for this romance, Ryan (Jason Peterson) the pizza delivery man arrives with her pizza and succeeds in pushing his way into her apartment to use her phone, etc. Ryan is taken with Riana and he does have higher aspirations, he wants to launch his uncle’s fertilizer business. Despite Ryan’s repeated persistence, Riana makes clear she is not interested in Ryan and he backs off. However, since he ends up becoming good friends with Riana’s sister and brother-in-law, she does run into him on occasion. Meanwhile, Riana has become serious about Derek (Andy Frye), an obviously better candidate for a would-be a Robert Browning suitor. Derek has a PhD in Literature and is seeking a position in academia; over time, however, Riana starts to see that Derek is not necessary perfect and she is conflicted when he asks her to move to Iowa with him, where he has taken a professorship. There is also a hilarious subplot involving Riana’s sister Joy (Jessie Rae Rayle) and her husband Cliff (Ryan Lear), who have relationship problems of their own. Jason Peterson is the centerpiece of this production with his quirky but appealing portrayal of Ryan. Near the end of the play, you wonder why Riana does not see that this charming pizza delivery man is by far the better choice for her. Jessica Lind Peterson’s Riana can at times come off a little whiny, but as the chemistry between her and Ryan grows, her character becomes more special. Frye, as the stuffy academic, dodges the normal stereotype and brings to life a flawed but realistic person. Rayle and Lear are both hilarious in their comic roles without letting this detract from their characters’ genuinity. Instrumentalist Blake Thomas provides a tapestry of accompaniment. Photo by Justin Cox. Blake Thomas is on stage during the entire production playing a guitar and other string instruments. His music is often enchanting, especially as interludes between the scene changes. I am surprised at how many active theatre goers have yet to attend a Yellow Tree performance. Although Osseo is a not in any of the “main” cities’ theatre districts, it is only a 20 minute drive from the heart of Downtown Minneapolis. Attending String would be a wonderful introduction to this thriving young theatre. 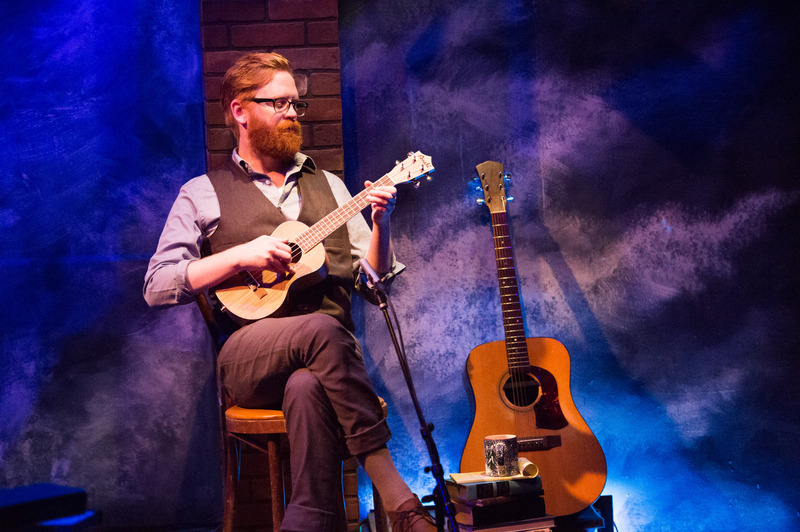 String plays at Yellow Tree Theatre in Osseo, MN through October 15, 2017.